Chief Justice Anthony Smellie, QC, J.P., LLD (HC) Liverpool; LLB (HONS.) was appointed to the JLSC in accordance with section 105(1)(c). Chief Justice Smellie holds a LLB Hons. from the University of the West Indies and a LLD (HC) from Liverpool in 2006. He also holds a Diploma in Development & Finance Law from the International Development Law Institute in Rome, Italy. Chief Justice Smellie was initially called to the Bar in Jamaica as an Attorney-at-Law before serving as Clerk of the Courts (Westmoreland, Jamaica) from 1976 to 1977; Crown Counsel and Assistant Director of Public Prosecution (Jamaica) from 1977 to 1983. He taught as an Associate Lecturer at the Norman Manley Law School in Jamaica from 1980 to 1983 before moving to the Cayman Islands. 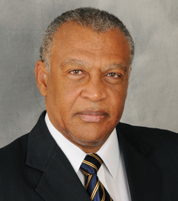 Chief Justice Smellie began his career in Cayman as Principal Crown Counsel and Solicitor General from 1983 to 1992. He served as Attorney General Cayman Islands (Acting) from January to November 1992 following which he was appointed as a Judge of the Grand Court where he served from January 1993 to June 1998 when he was appointed Honourable Chief Justice. Chief Justice Smellie was appointed one of Her Majesty’s Counsel in August 1991 and served as a team member of the Financial Action Task Force (mutual evaluation of United States Legal and Financial Anti-money Laundering Regimes) in 1996. He has also served on the Mutual Legal Assistance Authority (Cayman – United States MLAT) since 1993. Chief Justice Smellie is a Honorary Bencher, Grays Inn, London, England; Honorary Fellow Institute of Advanced Legal Studies (University of London); Patron: Commonwealth Law Journal, Oxford University Press; Alumnus, London Business School (Executive Education Programme); Member – Insolvency Practitioners International (Insol). He was nominated as a member of the International Hague Network of Judges for the Convention of the Protection of Children and served from July 2011 to June 2013; and nominated by the Society of Trust and Estate Practitioners as a judicial member in April 2013. He has been appointed as a Member from 1 January 2017 – 31 December 2020. Copyright © 2019 Judicial and Legal Services Commission - All Rights Reserved.